After going through a difficult year in 2016 following the jet downing crisis in November 2015, the biggest destination of Russian tourists in Turkey, the holiday resort province of Antalya, saw an all-time record in the number of Russian visitors in 2017 as the city hosted 3.8 million vacationers from the country with a record increase of 671 percent compared to 2016. 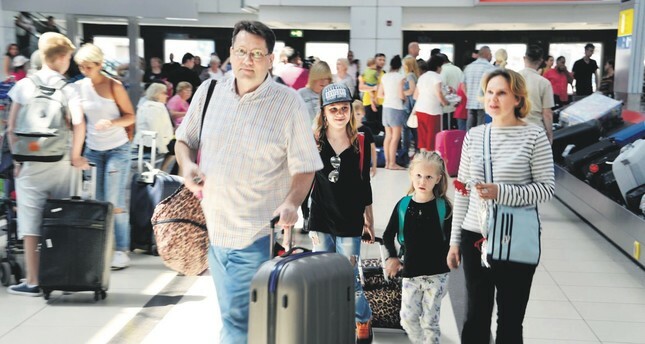 The city welcomed 10.5 million tourists from a total of 184 countries from the Antalya and Gazipaşa airports, in addition to transit passengers from Istanbul. Antalya Governor Münir Karaloğlu said the 2017 figures skyrocketed after 2016, which brought major problems for the tourism sector due regional issues and the coup attempt of July 15. Antalya Governor Münir Karaloğlu informed that the city was visited by 6.4 million tourists in 2016 while the number of visitors reached 10.5 million by the end of 2017. Pointing out that there was increase of about 57 percent in 2017 compared to the previous year, Governor Karaloğlu said Antalya achieved this success with its potential, adding that the public administration, local authorities, private sector, the tourism sector's nongovernmental organizations (NGOs) and the press organs in the city did their parts. "Our friends working in the sector made major sacrifices, enabling us to close 2017 with a good result. We welcomed 2018 with this good spirit and motivation," the governor added. As for the 2018 projections, the city administration expects an increase of 35 to 40 percent compared to 2017, taking into account early reservations, aircraft slots, and the mobility in the target markets. "Provided that we do not have any problems, we wish to talk about a figure of around 14 million by the end of 2018," he said. Assessing the record increases achieved in the Commonwealth of Independent States (CIS), particularly Russia and Ukraine, Governor Karaloğlu said the all-time record was broken in the Russian market in 2017. Noting that the city hosted close to 3.8 million tourists from Russia, the governor said they foresaw this market to grow further in the meeting. "Of course, Russia has a hinterland where it is quite effective. We had a serious leap in the CIS region last year," Karaloğlu said, recalling that Russians led the way in the number of tourists coming to Antalya in that period with a share of 40 percent. Governor Karaloğlu said they are pleased with the growth in the Russia-CIS market, but that they do not want to be dependent on only one market, underlining that they have carried out very series projects in terms of market diversity. "The Middle Eastern market is growing significantly. The figures are growing to a great extent proportionally compared to the 2016 and 2017 figures, albeit not as much as those of Europe and Russia," the governor continued, adding that they identified target markets such as Iraq, Jordan, Lebanon and Saudi Arabia. "We will try to diversify the market in 2018 and in the following years and to reduce the weight of the only market in Antalya. In doing so, we will also grow the figure by bringing tourists from different and new markets," he noted. Stressing that Antalya needs both market and product diversity, Governor Karaloğlu said the city has come to this point with its great advantage of beach tourism, adding that Antalya, which achieved this success through sea, sand, and sun, will continue beach tourism in the future as well. "This is Antalya's biggest advantage. However, crediting Antalya only with sea, sand, and sun will be the biggest injustice to the city," Karaloğlu said, highlighting that the tourism should be diversified, and all facilities should be mobilized in Antalya. On a country-by-country basis, Russia came to the fore to a total of 10.5 million tourists coming to Antalya in 2017 from Antalya and Gazipaşa Airports, in addition to the transit passengers from Istanbul and other airports. Russia sent 3.8 million tourists to the city with a record increase of 671 percent compared to 2016, also constituting 40 percent of the total number of tourists in that period. A total of 3.5 million Russian tourists came to Antalya in 2014, which is regarded as the golden year of tourism, followed by 2.8 million in 2015 and 492,349 tourists in 2016. Meanwhile, 1.7 million tourists came from the German market, which came second in the number of tourists, with a decrease of 15 percent, followed by Ukraine with 715,000 tourists with an increase of 24 percent, the U.K. with 375,000 tourists with an increase of 8.5 percent and the Netherlands with 275,000 tourists, which experienced a decrease of 21 percent compared to the previous year.